There are two big advantages when searching for information about a car such as this: there were only 20 made, and the registration number is there for all to see. The picture was taken in 1968 at Oulton Park – and judging by the closeness of the spectators it was at that time just a car to be used and parked on the grass. A car for high days and dry days, perhaps, but not a car to be stored away in a high-security air-conditioned garage because of its eye-watering value. This car, chassis number DB4GT/0184/R, was the subject of a full road test by Autocar magazine in 1962. Some figures from that test give an idea of how special a car it was: 153.5 mph one-way top speed, a standing quarter-mile in 14.5 seconds, and 140 mph in 32.2 seconds. To quote Autocar: “Such figures are astonishing by production car standards, but of equal importance was that little drama was involved when achieving them…” And the price was £5,469 19s 9d. After the road test the car was sold to Dunlop for experimental tyre-testing work and was naturally fitted with Dunlop disc brakes. It was then sold into private hands in 1967. 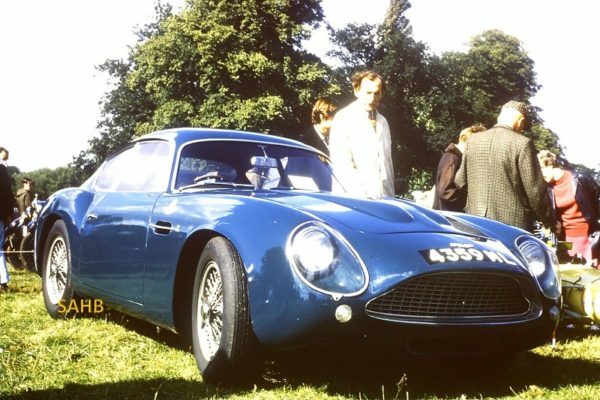 Only four of the original Zagato chassis, 0191, 0193, 0182 (1 VEV) and 0183 (2 VEV), were built to a lightened DP207/209 specification especially for racing, with a lower roofline, larger rear wings, a reshaped tail and a flatter, longer front end. Our car was therefore almost certainly never raced in period – but there is a 2002 picture of it at the Le Mans Classic, complete with a serious-looking rollover bar and a driver in full-face helmet, so it’s good to see that it has been exercised in the way we would wish – despite its rarity and value. We can only imagine the conversation between the owner and a spectator on that sunny day at Oulton Park, prompting perhaps a shocked response to the information that the car was worth several thousand pounds, even second hand.